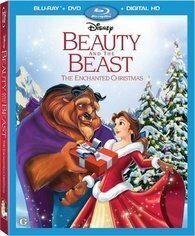 Celebrate the most magical time of the year with this Special Edition of the irresistible holiday classic inspired by Disney's Academy Award(R)-winnng masterpiece, Beauty And The Beast (1991: Winner -- Best Song, Best Original Score; nominated for Best Picture). Share the wonder as Mrs. Potts (Angela Lansbury) recounts another "tale as old as time" about a Christmas past that almost wasn't -- thanks to the scheming of former court composer Forte (Tim Curry), now a gloomy, holiday-hating pipe organ, determined to keep Belle and Beast apart forever. Only a true Christmas musical could possibly thwart his dastardly plans. Reuniting the original voice cast, this spectacular gem sparkles with exciting bonus features, delightful songs, spellbinding visuals, and enduring themes of hope, friendship and love. Your family will experience the spirit of the season all year long with the timeless magic of Beauty and the Beast: The Enchanted Christmas.